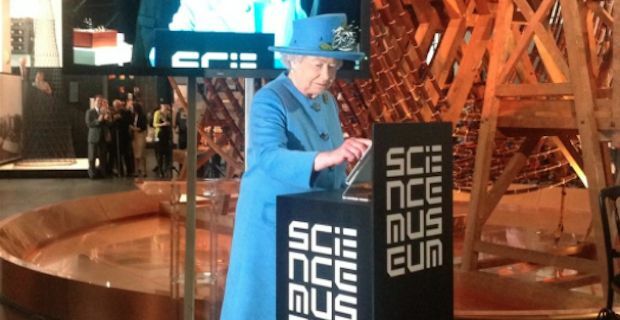 The Queen was on duty to open a technology gallery at the London Science Museum today but it wasn't all business for her majesty. Queen Elizabeth took the opportunity of availing of the abundance of technology in close proximity to post her first tweet to her fans on Twitter. The @BritishMonarchy account has been in existence since 2009 and has approximately 3/4 of a million followers but it has never had a single tweet sent personally by the Queen until today. The account is used primarily for updates from Buckingham Palace about the work and activities of The Royal Family. The message was typed out for her on advance and after stepping up to a tablet, Elizabeth simply needed to hit the Tweet button to broadcast hew message to hundreds of thousands of followers. The tweet read "It is a pleasure to open the Information Age exhibition today at the @ScienceMuseum and I hope people will enjoy visiting. Elizabeth R."
The message received a huge response in the twitterverse. It had gotten over 10,000 retweets within 2 hours of it going out and it also had the knock on effect of adding about 30,000 followers to the account within the same time period. Director of the Science Museum Ian Blatchford, in his introduction of the her majesty, made a point of how the Queen has been an avid early adapter of technology throughout her reign. He made reference to when she "made the first live Christmas broadcast in 1957", and in 1976 she "became the first monarch to send an email". He then invited her to step up to the tablet by saying "May I now invite you to join me so that you may send your first tweet." before the Queen removed her glove and sent her tweet out to great applause.